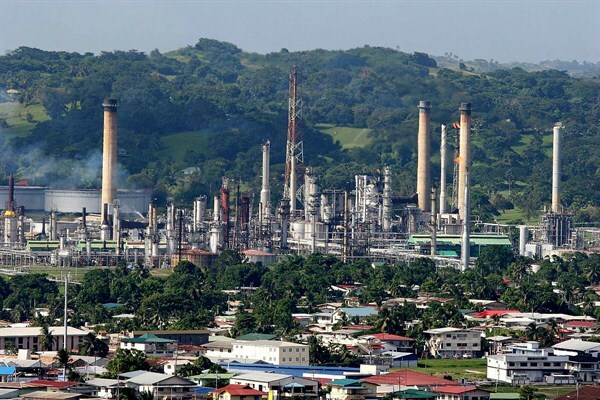 A refinery of the state-owned oil company Petrotrin in Pointe-a-Pierre, Trinidad and Tobago, Sept. 5, 2005 (AP photo by Shirley Bahadur). Resource booms and busts are a sad reality for most commodity-based developing countries, and Trinidad and Tobago is no exception. While by far the wealthiest of the Caribbean economies, thanks to its oil and gas resources, the country is currently mired in a severe recession after the collapse of world oil prices beginning in 2014. The economy contracted by 1 percent that year, followed by further declines of 2.1 percent in 2015 and 2.8 percent in 2016, according to data from the International Monetary Fund.